Guerrilla Acts (Response to Art in the Streets) | Whose Water? Bookmarks with articles from the United Nation’s “Universal Declaration of Human Rights” were randomly placed in books around local art venues: a response to “Art in the Streets” at Museum of Contemporary Art, Los Angeles, CA, 2011. 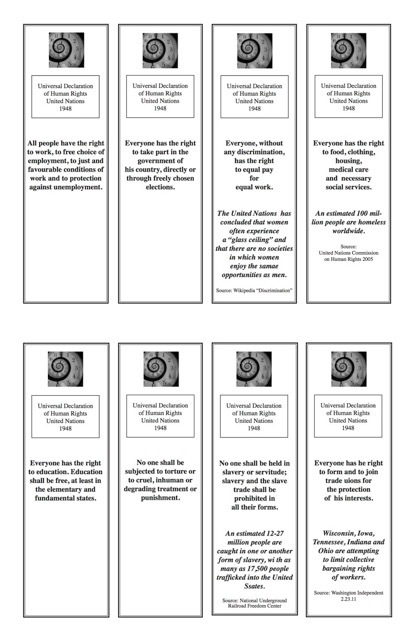 Bookmarks with statements from the Universal Declaration of Human Rights issued by the United Nations in 1948 were contrasted with facts from various sources that illustrate violations of these principles locally and nationally. AKFAW randomly placed the bookmarks in books around local art venues as a response to Art in the Streets at the Museum of Contemporary Art (MOCA), Los Angeles, CA, 2011.